Michigan's 14 invites to the NFL combine—the most of any program—are just another sign that Jim Harbaugh's system is working. INDIANAPOLIS — Last season, determining the best team in the Big Ten was a fool’s errand. You had the conference champion, Penn State, the West Division champion, Wisconsin, the team with the best overall record, Ohio State, and the team that looked best in games, Michigan. That’s an excruciating bar argument waiting to happen, but for many, the two schools that passed the eye test were the Buckeyes and Wolverines. In the two years since Jim Harbaugh took over in Ann Arbor, college football’s most, uh, unique coach has narrowed the gap between his team and Ohio State, and last week in Indianapolis, he proved he’s inched another step closer to unseating Urban Meyer at the top of the Big Ten. At the NFL’s annual scouting combine, Michigan sent the most players of any team in 2017, with 14 invitees. That tied the number Ohio State sent last year, in a spring when the Buckeyes saw three of their players picked in the top 10 of the NFL draft and five in the first round. Although Michigan won’t come close to matching those numbers at the top of the draft—only defensive end Taco Charlton and safety Jabrill Peppers are expected to be among the first 32 players picked this year—its attendance in Indianapolis is just another sign that the Harbaugh model is working. It’s easy to think Harbaugh’s NFL connections are instrumental in the number of invitations his players secured, but it goes beyond that. Certainly the Wolverines have an extra level of familiarity when meeting with the Ravens, and they seem to answer more questions from teams about their head coach than players from other schools, but that’s almost superficial. The 14 players Michigan sent to Indianapolis speak to the nature of the program Harbaugh has built in Ann Arbor. It’s grueling, reminiscent of an NFL team’s regimen—and he put it almost wholly in place in a matter of months. And as for the lack (compared to last year’s Buckeye’s, at least) of first-round talent, well, that isn’t the point. Superior coaching did not Myles Garrett make. Phenoms, No. 1 picks, aren’t the products of programs—although with the way Harbaugh recruits, Michigan should have a few of those, too, in the next few years. 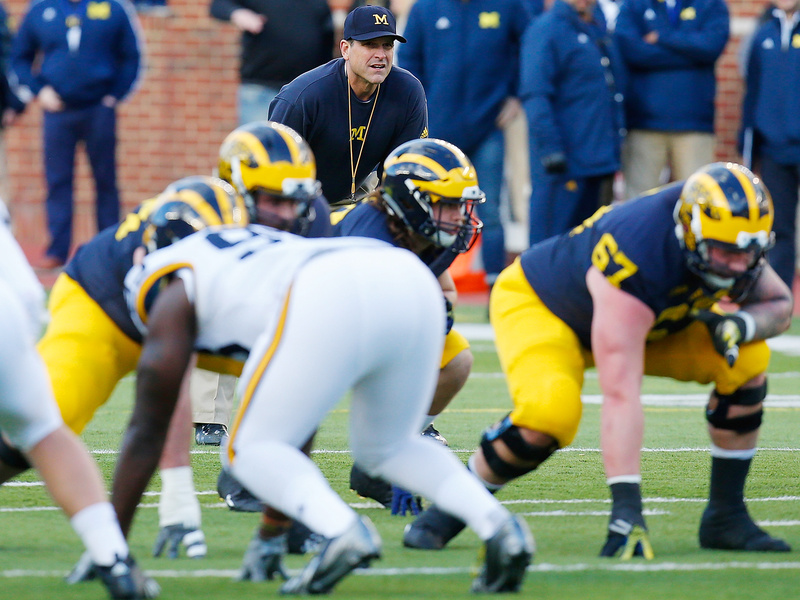 The volume of players, however, is a direct result of what Harbaugh has done. He’s taken another coach’s players, guys Brady Hoke recruited, and made them the No. 10 team in the country last season. He’s coached good players into the NFL, and that’s the best a school or a player can hope for.